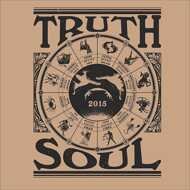 Truth & Soul is proud to present a sneak peek into our 2015 roster with this exclusive Record Store Day release. Unreleased tracks from six of our artists' upcoming full lengths pressed on a gold translucent colored vinyl in a picture sleeve. the mixes on this record will only be on this limited RSD vinyl release. Here's a sneak peek into the future of Truth & Soul Records, enjoy.